It's the biggest native plant throw down in the state! 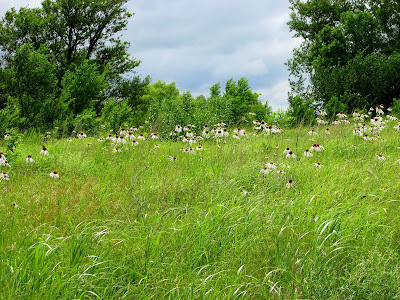 The Annual Wildflower Weekend will happen in the Manhattan Kansas area in September 2015. Attend the AWW and meet native plant enthusiasts from Kansas and beyond - walk the prairie with plant experts - be part of the audience receiving brand new education and research going on in Kansas prairies. Download the 8 page itinerary for all the details and activities and pay your registration online. If you are traveling, check the hotels listed in the itinerary for recommendations. Do it now! See you in Manhattan! Visit www.kansasnativeplantsociety.org and click on the Annual Wildflower Weekend link on the left side. The following updates occurred in February. Don’t forget to check out changes to our home page as well at Kansas Native Plant Society. The following updates occurred in January. This gallery is composed of images taken by members of the Kansas Native Plant Society. Thanks to Emmett Sullivan for the latest addition of Michigan Lilly to the gallery. If you aren't already a member of KNPS, we encourage you to Become a Member. Once a member, we hope you will share your wildflower images by Submitting Images to the gallery. The Kansas Native Plant Society (KNPS) is accepting applications for a $1,000 scholarship in support of graduate student research that enhances our understanding of native plant species or their ecosystems and conservation. This scholarship is open to all graduate students regularly enrolled in a Kansas college or university. Proposals must be technically sound and directly applicable to our priorities in Kansas. A complete proposal shall include the application form, two letters of support from the student’s major professor and/or advisors, and copies of your college/university transcripts. The application form includes a project description, time line, budget, career goals, and a statement of your interest in plants. Proposals will be assessed based on the merits of the proposed project and how well they fit the objectives of the scholarship. The budget will not be used as a basis for assessing or ranking proposals. Reviewers will consist of scientists and non-scientists, so keep your narrative readable to a wide audience. The KNPS Awards Committee will review applications and announce results in mid-April. Awardees will receive recognition at the KNPS annual meeting. They will also be recognized in the KNPS newsletter and on the KNPS website. Successful applicants will agree to include the following acknowledgement in all publications resulting from research supported under this program: "The Kansas Native Plant Society provided partial support for this work." The deadline for receipt of proposals is March 15, 2015. Award recipients will be notified by April 15, 2015. Mary A. Bancroft Scholarship contains the application and more information about the scholarship. This 2015 Scholarship Request for Proposal (PDF) can be downloaded & printed. The following updates occurred in December.